Connectors play a key role in defense and military applications, such as communication, navigation, radar, airborne and marine guidance control, electronic warfare and many others. One of the main characteristics for these high performance connecting solutions is ruggedness. Connectors for military applications have become stronger, more durable, battling harsh conditions and brute forces. They also become lighter and smaller. 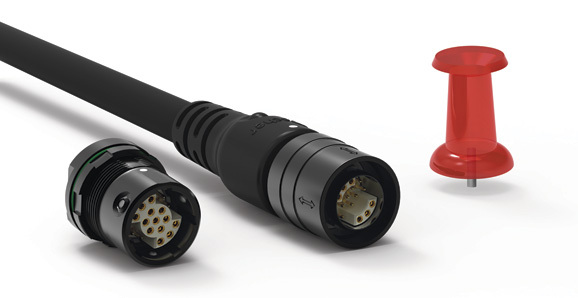 Fischer Connectors, a worldwide leader in circular push-pull connectors and cable assembly solutions, offers a wide range of connecting solution that fulfill the needs for defense and military use. New technologies and product extensions taking miniaturization and user friendliness into consideration even provide a larger choice. In this edition of Soldier Mod, Fischer Connectors shows an overview of the latest product developments. Connectors have to be rugged enough to withstand dirt, grime and weather, but should be small, light, and easy to use in tense situations. Connections must be made in fractions of a second, and often, they have to be made when wearing gloves, favoring push-pull connector designs that lock and unlock instantly rather than requiring twists. Communications devices must work 100% of the time, whether they are radios to talk with commanders or remote control devices for robots that peek around corners and report back electronically. Therefore, designers for military equipment should consider connectivity holistically with the design of their device. This can help them limit the number and size of connectors, and reduce cabling as well. The Fischer MiniMax™ Series is an innovative, first-to-market, high density miniature solution with a unique combination of power and signal contacts enabling more functionality into smaller devices and lowering over time the cost of ownership. This connector is ideally suited for handheld or body-worn applications, for instrumentation and for test equipment where user-friendliness and easy handling are a must. The Fischer MiniMax™ Series has just been launched in its pin socket version and is now available in 19 and 24 pin configurations, giving design engineers more flexibility, especially where space and weight restrictions play a role. Available as standalone connector, the pin socket connector can be mounted on a flex or cabled by the users, or purchased as a complete pre-cabled solution. While the 24 pin configuration is available with 4 power and 20 signal contacts, the 19 pin configuration of the Fischer MiniMax™ Series features 4 power and 15 signal contacts as standard, with as unique feature the possibility to increase the number of power contacts depending on the cable used. Within the signal contacts, there are 2 advanced contacts for USB power connections as available option. The Fischer MiniMax™ Series is available in three latching systems: push-pull, screw lock and quick release. The Fischer UltiMate™ Series is considered as one of the most rugged connecting solutions in the industry. 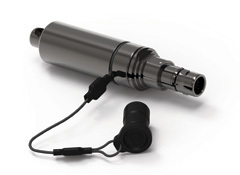 Its compact, lightweight circular connectors allow improved protection of troops, vehicles or other land-based equipment. Main features of the Fischer UltiMate™ Series are its miniature size, ultralight and rugged design, extremely robust keying, high shock and vibration resistance, excellent shielding, and ultimate ingress protection level of IP68/69, even unmated. 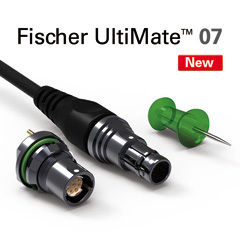 Like for the Fischer MiniMax™ Series, Fischer Connectors leads the trend of miniaturization and offers a smaller connector with the 07 size. With plug and receptacle diameters starting at 12mm, the Fischer UltiMate™ Series 07 is available in a 2 to 10 contact configuration. This allows design engineers to create smaller devices with more connections and more functions at the same performance or even better. The Fischer UltiMate™ Series is now available in five sizes (07, 08, 11, 13 and 18) and in configurations from 2 to 42 pins. From its smallest 07 size to its largest 18 size, all Fischer UltiMate™ connectors are perfectly suitable for harsh and extreme environments: the Fischer UltiMate™ Series is sealed IP68/69 mated and unmated and has a high corrosion resistance of 1,000 hours. Combined with the 360° EMC shielding, the guaranteed 10,000 mating cycles and an operating temperature from -55°C to +135°C, the connector is the right choice as it requires less maintenance, is cost effective and slow aging. When military operations are taking place under the toughest conditions, quick and easy transfer of data can be a very difficult procedure. The Fischer Rugged Flash Drive is an extremely tough memory stick, specially designed for safe storage and transportation of sensitive data in harsh environments. The memory module is mounted within a rugged casing designed to provide full protection against extreme environmental conditions or unwanted actions. The unique Fischer Connectors circular interface, combined with durable encapsulation technique, guarantees data security in case of loss or theft. The Fischer Rugged Flash Drive is equipped with high speed flash memory, signaling and protocol certified, and is available from 4 GB to 64 GB as standard, with larger capacities available on request. Miniature and lightweight, the Fischer Rugged Flash Drive is the smart portable solution for daily field use and is perfectly suitable for use with ruggedized computers. Ideal for harsh environment applications such as Defense & Military, Underwater, and many others, it is also a useful office tool when data security and confidentiality are critical. Its flexible modular design includes a large selection of body styles, sizes, contact configurations and memory capacities allowing it to be tailored to your needs. Since its launch in 2012, the Fischer FiberOptic Series has proven to offer the best quality and stability needed for an optical link, combined with vibration resistance easy mating and easy field cleaning. The Fischer FiberOptic Series performs perfectly in harsh and extreme environments and has a high ingress protection of IP68 mated, and IP67 unmated. This rugged push-pull connector for both indoor and outdoor applications comes pre-cabled for maximum performance and time saving. The Fischer FiberOptic Series with two (FO2) or four (FO4) optical channels features some revolutionary novelties. Fischer Connectors is able to offer a fiber solution that is extremely quick and easy to clean thanks to a removable mono-block mate adapter and to the possibility of rinsing the unmated connectors freely under water or in an ultrasound bath. 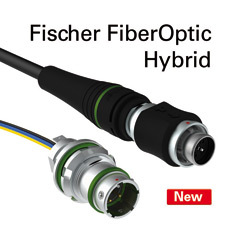 Fischer Connectors recently developed a hybrid version of the Fischer FiberOptic Series, the FOH 2-2. This connector with two optical channels and two electrical contacts is perfectly suitable for demanding indoor and outdoor applications, allowing both power and data to be transmitted flawlessly through one connector. It saves space, money, design and installation time, and offers premium optical performance in all harsh environments. Fischer Connectors has been designing, manufacturing and distributing high performance connectors and cable assembly solutions for 60 years. Known for their reliability, precision and resistance to demanding and harsh environments, Fischer Connectors’ products are commonly used in fields requiring faultless quality. Primary design and manufacturing facilities are located in Saint-Prex, Switzerland, with subsidiaries and distributors located worldwide.